From mid to late 19th century, the Chicago saloon keeper was usually a man that sported superior intelligence who often directs his customers’ thoughts. He had in his possession the latest political and sporting news. He who can win and tell the best story is, not by election, but by virtue of fitness, the leader. The saloon is, in short, the clearing-house for the common intelligence—the social and intellectual center of the neighborhood. At least that’s how a sociologist from 1900 explained it. During Chicago’s massive annexation years near the turn of the century, Chicago inherited several schools. On April 26, 1904 it was revealed after a secret investigation that three Chicago Public Schools were named after saloon keepers. The Board was appalled and almost immediately voted to have new names chiseled in the buildings. Trustee Ole A. Thorp, chairman of ths committee on the naming of schools, said he would support the resolution. District Supt. Albert G. Lane declared that the schools bearing the names of saloon keepers were named before they were a part of the city system. According to the 1899 Lakeside Directory, Mathew W. Gallistel ran a Saloon with his brother at 180 106th Street and in the 1886 Directory, Luke O’Toole had a saloon as well. John Buckley was listed as having a saloon at 3918 S. State in 1886. Buckley School, 48th and S Hermitage Ave. changed to Branch of Seward. O’Toole School, Northeast corner Forty-eighth and Bishop streets, changed to John H. Hamline School. Gallistel School, 104th corner Ewing, changed to William Mavor School. The new names were chosen with care. William Mavor was a building contractor who also served as the 6th ward alderman. John Henry Hamline (1856–1904) was a prominent Chicago lawyer. There can be some questions in regards to this “research” that was performed as two of the three men that the schools were named after were in fact, very popular in their areas. In 1854 Matthew Gallistel settled in Chicago. He was a prominent member in the Southeast Side of Chicago. He succeeded J. Bremer as Postmaster of the Postal Service in 1880. With this he carried on a real estate and fire-insurance business. In 1863 he married Miss Marie Duschek and had five children. While president of South Chicago Board of Education a school was erected and named after him. Luke O’Toole was listed as the assessor for the Town of Lake in the 1887 Lakeside Directory of Chicago. The third, J. Buckley, owned a grocery store near John Buckley’s State street saloon at 4072 S. Dearborn. Not certain if these two were the same person, but what are the odds if they weren’t?. However, it seems that these changes were never made, or if they were, it was for a very short time. According to the Chicago Public Schools website, Luke O’Toole Elementary School still exists at 6550 S Seeley Ave in Englewood. 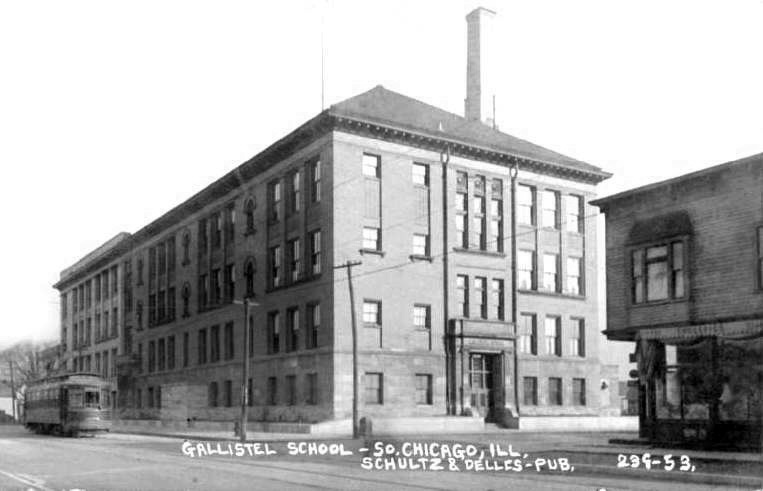 The same site also lists the Gallistel Language Academy at 10347 S Ewing Ave.
Sources: “The Saloon in Chicago” by Royal Melendy, The American Journal of Sociology, Volume 6, Number 3, November, 1900. “Amazed at Chicago Names,” The Chicago Tribune, April 27, 1904. Directory of the Public Schools of the City of Chicago 1904-1905.